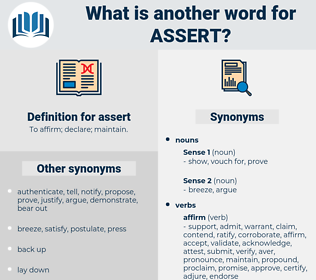 What is another word for assert? be a credit to someone. say, declare, state, safeguarding, stress, advocate, reiterate, purport, submit, promote, support. lay, vindicate, reaffirm, say, restate, impose, imposing, upholding, demonstrate, reclaim, declare, consolidate, assume, state, safeguard, safeguarding, pretend, stress, showcase, advocate, reassure, reiterate, prevail, entrench, reconfirm, substantiate, articulate, preserve, re-affirm, highlight, validate, ensure, practise, realize, introduce, conclude, bolster, allay, submit, promote, wield, support, supported, guarantee, retain. affirm, argue, claim, allege, suggest, contend, maintain, proclaim, insist, defend, underscore, indicate. 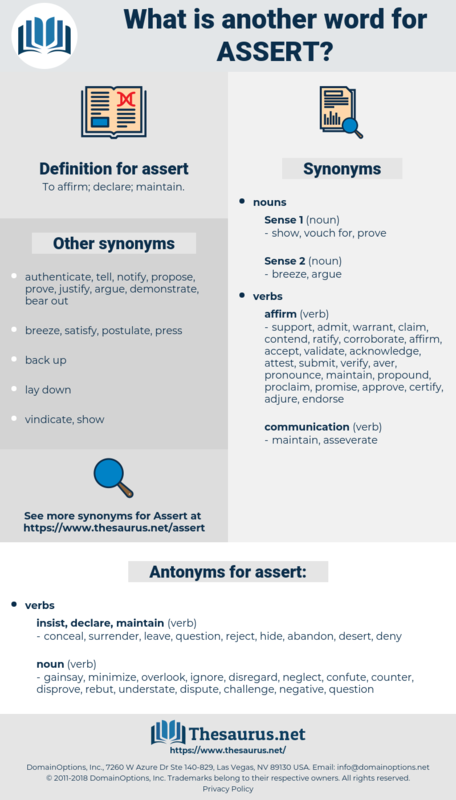 reassert, affirm, argue, claim, enforce, exert, assure, allege, suggest, contend, ascertain, maintain, Establishing, attest, pursue, invoke, Invoking, proclaim, insist, strengthen, sustain, defend, prove, underscore, indicate, implement, reinforce, apply, secure, acknowledge. conceal, surrender, leave, question, reject, hide, abandon, desert, deny. gainsay, overlook, disregard, challenge, counter, negative, rebut, disprove, confute, understate, neglect, minimize, ignore, dispute. No doubt with her opinions she felt specially drawn to assert herself to - day. The pig would make several attempts, would go on trying until he had no soldiers left, because he would feel that the only thing really worth doing was to assert himself against the confident foe. accredit, ascaridae, acquired, assorted, awkward, Azurite, assured, accurate, accrete, acerate, acridid, aggrade, ascaridia, access road, acardia, acarid, acaridae, asgard, accredited, acrid, ague root, assort, akaryote, accrued, asserted, agreed, acridity, acaryote, aigrette, akeridae, acrididae, accord, aigret. predicate, aver, proclaim, allege, say. take a firm stand, insist.